VetCPD Congress returns for 2019 with impressive speaker line up. 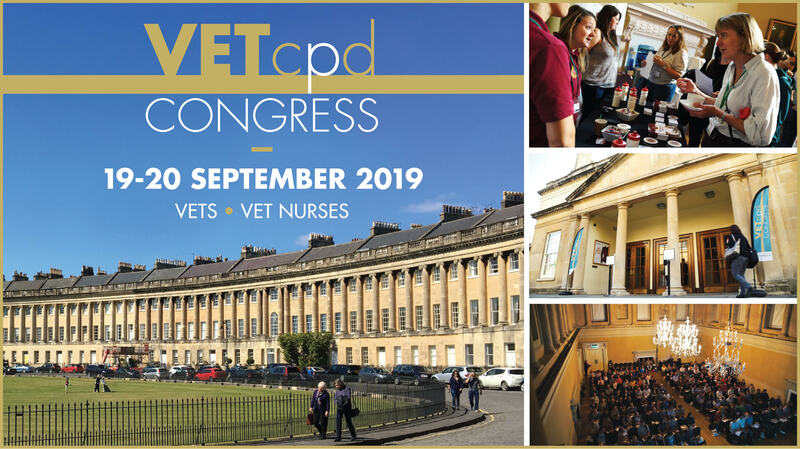 VetCPD are delighted to announce the launch of VetCPD Congress 2019. Aimed at small animal vets and vet nurses, it takes place in the World Heritage city of Bath at Bath’s Assembly Rooms with its impressive Georgian splendour and surroundings. This congress has rapidly established itself as the go-to CPD and networking event for Veterinary professionals in the South West. Last year’s event welcomed over 360 delegates and 26 exhibitors. It returns on 19-20th September 2019 and will feature an impressive line-up of respected, subject-matter expert speakers who will deliver first class lectures in two streams tailored for vets and vet nurses. The nursing lecture programme highlights will include, Denise Prisk’s, ‘Under pressure! Blood pressure issues in the anaesthetised patient’ and Sophie McMurrough’s ‘Common poisons and their management’. Whilst, in the Vet programme, lectures such as Chris Scudder’s, ‘Management of canine and feline diabetes’, Carolyne Crowe’s, ‘How to thrive at work’ and Poppy Bristow’s lecture about ‘Mitral valve repair surgery’ will enable delegates to take useful and practical CPD knowledge away with them, and provide them with helpful advice for them to put into practice in their daily working lives. Many of the previous years’ attendees have also commented on the useful networking opportunity that the event provides, with the chance to meet fellow professionals within the veterinary world, as well as view some of the different veterinary services that exhibit. This networking opportunity extends beyond the event, as a delicious dinner is always organised with entertainment at a local restaurant on the Thursday evening which is usually very well attended by delegates and exhibitioners alike. “As a Vet with twenty plus years’ experience in the profession, it’s great to attend a CPD event like this where I’ve gained excellent ‘top tips’ and ideas to take back to my own team and I would highly recommend this event to both experienced and new Vets alike”. “There has been a fantastic and varied range of CPD at this event. It offers great value for money in a stunning location. Jake Hannabuss’s lecture about ‘What can the aviation industry teach the veterinary nursing profession about human error’ was fascinating, and his engaging manner meant that he held the audiences’ attention throughout so that you could have heard a pin drop during it such was the audience interest”. VetCPD Congress 2019 ‘Super Early Bird’ ticket prices have also been announced at just £169 +VAT. Tickets can be booked online at www.vetcpdcongress.co.uk or 01225 445561.